This temple site rarely appears on the itineraries of Western tourists but it is of some historical importance due to its links with the formation of the Mataram kingdom. At this point, the best internet sites about this temple are in Indonesian, so I have chosen to offer a short introduction to it here. It is thought that this temple dates to the year 732, making it the first structure attributable to the old Mataram kingdom, which ruled Central Java from 732 to around the middle of the tenth century. The temple remains, which are built from andesite, cover an area of about 2500 square metres and are located on top of a small hill. It was here that the important Prasasti Canggal was discovered in 1879. This inscription proclaims that King Sanjaya had established a kingdom by subduing his enemies and had mounted a lingam in commemoration of his victory. At Candi Gunung Wukir (which is also known as Candi Canggal) you can indeed find a stone yoni, a receptacle representing the creative power of the goddess, inside a small stone temple where a lingam, represrenting the god Shiva in the form of a phallus, was once mounted. The yoni is still in situ, but the lingam has also been transferred to Jakarta. It is interesting that the formation of the Mataram kingdom is linked with Shiva worship and the subjugation of enemies. It is often thought that the spread of Shiavism (replacing worship of the more benevolent diety Vishu) marked a period of increasing warfare and conquest in South-East Asia at this time. It is also worth mentioning that the rise of Mataram may have been achieved by conquering Holing, an earlier kingdom thought by many to have been located in Central Java. 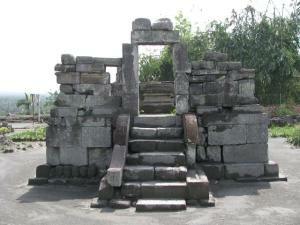 Candi Gunung Wukir is a small but important reminder of this phase of Javanese history. ← Who Built Candi Srikandi?